The process of finding the perfect wedding dress can be an emotional experience for anyone…even the celebrity bride. When Vanessa Minnillo ventured out for that wedding dress shopping trip every girl dreams of, it didn’t go as expected. Minnillo, whose birth mother hasn’t been in her life for more than 20 years, struggled with not having her mom there with her on that special day. “Normally this is something you do with your mother, and my birth mother hasn’t been in my life since I was 9,” she explains emotionally to PEOPLE. “I have been okay with that up until now but for some unexplained reason, it really overtook me. I felt lost, confused and sad. It was very emotional.” With her matron of honor, friend Jennifer Birmingham-Lee, by her side, Minnillo worked with Monique Lhuillier to try and find the perfect dress. “This was the hardest decision in the whole wedding planning … probably because I didn’t have the support of Nick [Lachey],” Minnillo says. “We decided everything together, even his [Dolce & Gabbana] tux. For the first time, I felt a little bit alone.” To gain some clarity, the bride-to-be decided to ask for her groom’s opinion. What do you think of Vanessa’s Monique Lhuillier bridal gown? Let us know! 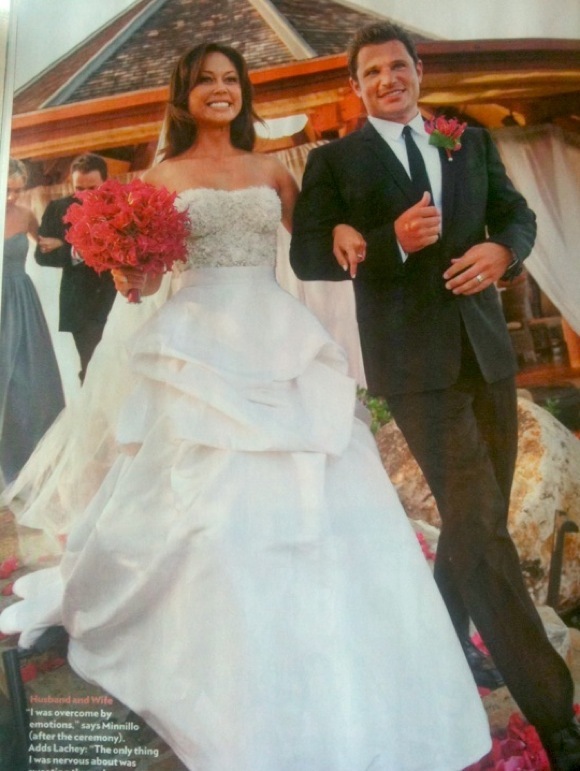 To see more of Vanessa and Nick’s wedding, check out the current issue of PEOPLE magazine.